This is an inexpensive set of golf clubs to get your teen going in our great sport of golf. All the technology in this set is designed for beginners. The graphite shafts of the driver and the woods are light and easy to swing. All the clubs are oversized with a big sweet spot. The irons are offset to help square the clubface, and of course all the teens enjoy throwing the backpack bag on their shoulders. I would recommend this set only if you are unsure if your teen is going to like this sport, or if you just don't have the money to invest in a high quality set of clubs. However, if your teens are already addicted to this game and you want a decent set of clubs to get started, check out the Adams Golf A2 Irons. 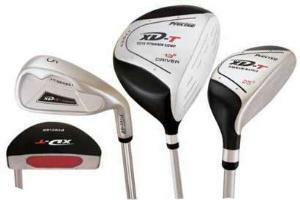 These are very forgiving clubs that they will learn to hit very quickly. What's more is, these clubs are much higher quality and will continue to compliment their game as your kids progress.